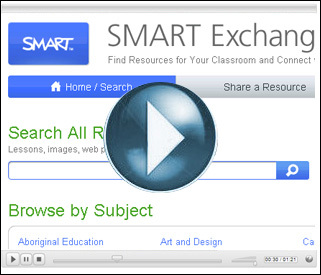 SMARTBoard: The SMART Exchange website allows you to search and download complete SMART Notebook lessons! Quick overview: A great website that allows you to search or browse for free and “ready-to-use” SMART Notebook presentations created by other teachers. This site is maintained by SMART Technologies, the manufacturer of the SMART Board. Hundreds of lessons are available, including FSL and Canadian content. Easy to use. This entry was posted in IWB and tagged free, free lessons, notebook lessons, smart exchage, smartboard resources, smartexchange. Bookmark the permalink.